Good almost-afternoon, readers! I hope you are doing well. The Challenge Your Nail Art group is doing a nail art challenge for February called Love Is In the Air and I’m trying to do a few of the prompts, despite not feeling well. Today’s prompt is “nail art technique I love” and how could I not do a dotticure? 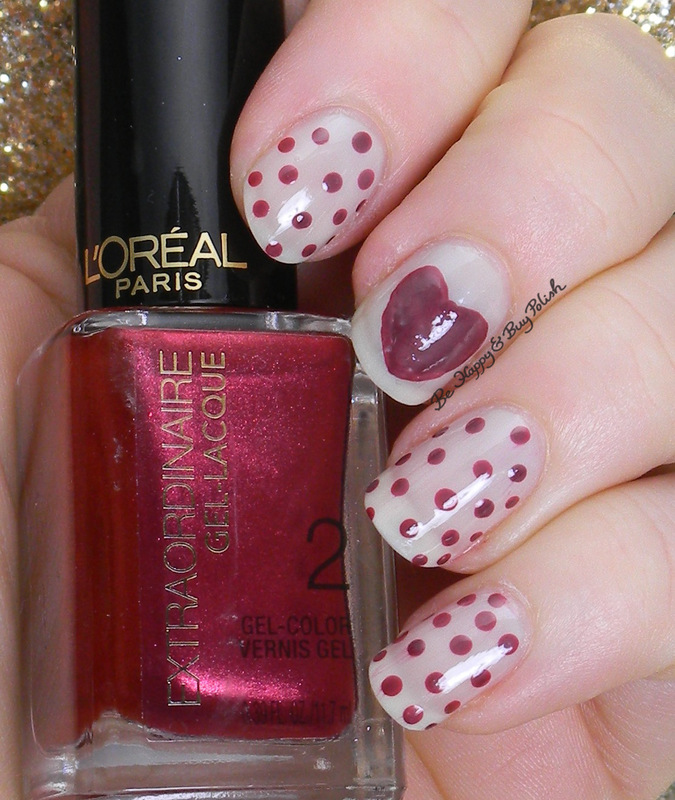 I started off with 2 coats of OPI Don’t Touch My Tutu, and used L’Oreal Hot Couture (gift) for my heart and dots. I then used one more thin coat of Don’t Touch My Tutu on top. Tomorrow’s prompt is “I Love the Color…”, any guesses as to what my favorite color is right now? This is so cute and lovely! I can’t believe you are still feeling sick but still participating, you are a rock star!!! I’m going to guess light neutral colors… or some type of off-white/cream color? I love hearts so this looks great to me. This is so cute!! I hope you feel better soon! 🙂 I want to take part in this challenge as well but seem to be down with some cold as well so I’ll try my best! This is adorable! I might have to steal this idea for next year.